Look at figure 14-16. Here, you see a comparison of the symptoms of heatstroke and heat exhaustion. These are dangers you face when working or exposed to conditions that might cause heatstroke or heat exhaustion. HEATSTROKE Sunstroke is more accurately called heatstroke since it is not necessary for a person to be exposed to the sun for this condition to develop. It is a less common but far more serious condition than heat exhaustion, since heatstroke has a 20% mortality rate. The more important feature of heatstroke is the extremely high body temperature (105 F [41 C] or higher) that accompanies it. In heatstroke, the victim has a breakdown of the sweating mechanism and is unable to eliminate excessive body heat built up while exercising. If the body temperature rises too high, the brain, kidneys, and liver may be permanently damaged. Signs and symptoms of heatstroke. Sometimes the victim may have preliminary symptoms such as headache, nausea, dizziness, or weakness. Breathing will be deep and rapid at first, later shallow and almost absent. Usually the victim will be flushed, very dry, and very hot. The pupils will be constricted (pinpoint) and the pulse fast and strong. Treatment of heatstroke. When you provide first aid for heatstroke, remember that this is a true life-and-death emergency. The longer the victim remains overheated, the higher the chances of irreversible body damage or even death. First-aid treatment for heatstroke is designed to reduce body heat and includes the following: Reduce body heat immediately by dousing the body with cold water, or applying wet, cold towels to the whole body. Move the victim to the coolest possible place and remove as much clothing as possible. Maintain an open airway. Place the victim on his or her back, with the head and shoulders slightly raised. If cold packs are available, place them under the arms, around the neck, at the ankles, and on the groin. 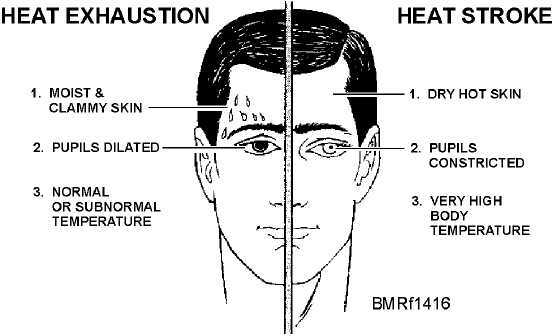 14-19 Student Notes: Figure 14-16.Symptoms of heatstroke and heat exhaustion.